The 2014 year seems to be a year for banks to pad their capital base. Previous heated discussion was around Tier 1 capital sufficiency, after which additional capital has been supplemented via issuing preference shares by SPDB, Bank of China and Agricultural Bank of China. Should you worry about the security issues in China? People prefer to keep their information in a safe place, so do nations. After the PRISM scandal information security issues has become a concern for many countries. 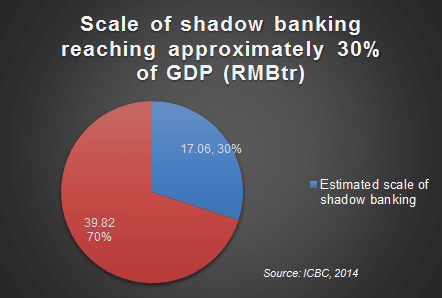 On April 20th, the CEO of ICBC, quoting data from internal sources, claimed that the estimated scale of shadow banking in China is around RMB15-20tn, which is relatively small in scale to GDP when compared to shadow banking in more developed countries. In addition, the leverage used in the Chinese shadow banking industry is not as large as other countries, so he argued that it is not necessary to worry about systematic risks in the Chinese financial system, but he still admitted there are non-systematic risks caused by shadow banking industry. However, many independent financial analysts say that the scale and risk involved of shadow banking are underestimated and there might be increasing number of events happened in 2014 around shadow banking in China. In recent years China's mobile internet has been developing quickly and had a great impact on people’s lives. The official figures show that by the end of 2013, China had approximately 500 million mobile internet users, a 25% increase over 2012. With the penetration of smartphones in China more users prefer to use mobile devices to deal with many daily tasks. Last month, Shanghai Chaori Solar Energy Science & Technology became the first company to default in China's bond market when it failed to make a full payment on the issued debt. This shows that the Chinese state is not going to back up even big private borrowers. Several other companies are also on the verge of debt insolvency, according to local media sources, with government debt also on the rise. Accroding to the latest figures from the CBRC (China Banking Regulatory Commission), Chinese banks’ asset quality deteriorated as the balance of bad loans continued rising from RMB 492.9 billion in 2012 to RMB 592.1 billion in 2013. However, as banks wrote off significant amounts of bad loans in 2013, the bad loans ratio grew only slightly from 0.95% to 1%, leaving the asset quality in relatively good shape. 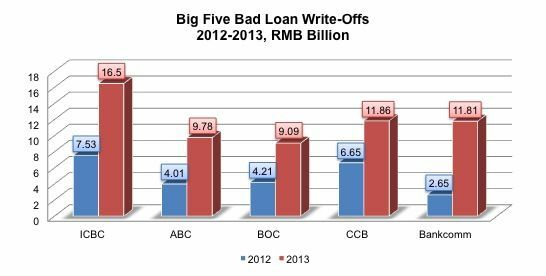 The largest outstanding bad loans are from the big five banks, who have hit a 10 year peak of bad loans - in total, they have written off RMB 59 billion up significantly from 2012. The large amount of write-offs prevent the bad loan ratio from growing fast. In addition, Chinese banks have a relatively higher provision coverage ratio, so they are able to write off more. As China is in the middle of an economic transistion, we estimate that banks’ bad loans will continue rising as exports continue to slow and industry shifts excess capacity. Further 2014 write-offs will be supported by the CBRC’s latest guidance. Special 'Bad Loan Development Zone' in the Yangtze? Once known for its economic development zone, the rich Yangtze river delta now has become a hotbed for something else: non-performing loans. The latest data from big five banks’ 2013 annual report shows that the cumulative profits in 2013 were RMB 870.3 Billion, accounting for approximately 60% of the banking industry. 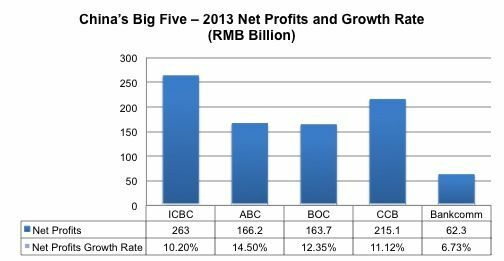 However, comparing with previous years’ performance, the net Chinese banks' profit growth rate of 2013 has slowed with the exception of BOC, which increased slightly. This decreased profitability is mainly due to narrowed net interest margin. Last year, in the context of interest rate reform and the influence from money funds, banks have been facing challenge and forced to transform. This will likely continue to become more pronounced in the future as banks are heavily reliant on interest income rather than fee income. 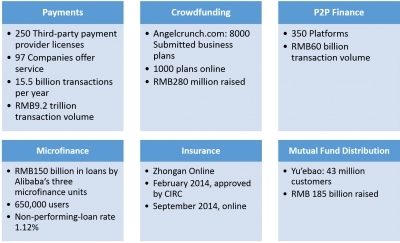 How should China's Online Finance platforms be regulated? This past weekend Alibaba and Baidu met with the People's Bank of China (PBOC) in a closed door session to discuss the ongoing challenges with Chinese online finance regulation. The fact that the regulators are consulting with the industry is a great sign that the regulations will (hopefully) be built on consultation and discussion, and as both Baidu and Alibaba have intentions of setting up their own private banks, it's likely in their best interest to sit down with the regulators as well. Over the past week news headlines have been awash with how Chinese banks are pushing back against Alibaba's Yuebao and Laicitong as the online finance products have rapidly grown their AUM at the expense of bank deposits. The banks now are expanding their push though and are challenging money funds' market share in China. In another foray from the Internet giant into high finance, Alibaba recently announced that one million virtual credit cards will be issued next week.